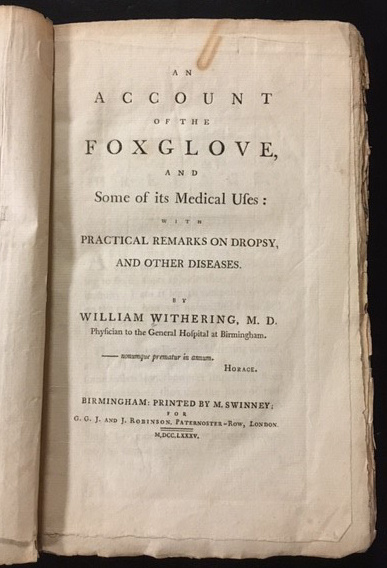 William Withering (1741-1799) was a British polymath, botanist, mineralogist, and chief physician at the Birmingham General Hospital. He attracted the attention of the medical world to the virtues of common foxglove (also known by its Latin name, digitalis) in the treatment of dropsy when he published his famous work, An Account of the Foxglove, and Some of Its Medicinal Uses, in 1785. He identified digitalis as an active component in one of the traditional remedies for dropsy and started to experiment with it. In doing so, he discovered that it was useful in the treatment of edema of cardiac origin. He addressed the problem of poor standardization in herbal medicines by studying what effects the different plant parts and seasonal changes have on the final product in order to achieve the required consistency. He established that the dried powdered leaf is more effective than the fresh leaf and that the powder form is preferable to the extract achieved by boiling. He demonstrated that some patients were more responsive to the treatment than others. He studied the dose-response and recorded all adverse effects. He described 163 cases observed in the Edinburgh Infirmary over a period of ten years and added several more cases as reported to him by other doctors via letters. His impressive work was one of the first modern studies of drugs. It was probably the reason foxglove was re-introduced to the Edinburgh Pharmacopoeia, after it had been purged as not useful during an earlier cleansing period. At the time the book was published, other physicians were using digitalis inappropriately. Although Withering’s study did not resolve all uncertainties between the heart, dropsy, and fluid retention, it was an advance based on clinical observation that changed medical practice forever. 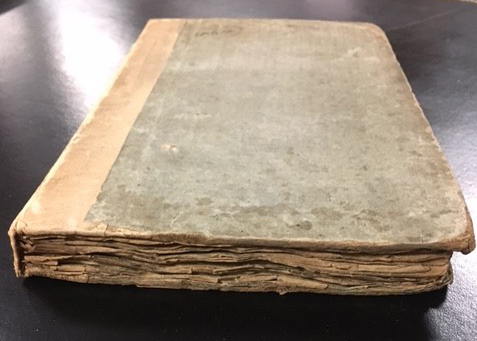 The copy held by Falk Library was a gift from James D. Heard, MD. It is bound in unassuming gray paper boards, but does not have the plates listed on p. xxi or color illustrations mentioned in other copies. The text, however, is one of the landmarks in the history of cardiac disease.